While SocialCode recognized that its selection of Duke last year was a bust, it touted its overall success in predicting the 2013 tournament, as well as its correct calls in 2012, including the University of Kentucky winning the title, and No. 15 seed Norfolk State University’s upset of No. 2 seed University of Missouri. Arbiters of data-driven decision making, SocialCode Labs has taken a calculated approach to bracketology the past three years with great success. Spearheaded by Director of Research Chris Poirer, SocialCode Labs analyzed thousands of social signals to determine which, if any, were correlated with game outcomes during March Madness. Ultimately, SocialCode Labs uncovered an interesting variable: volume of alumni from schools playing in the tournament who self-identify on Facebook as college basketball fans. 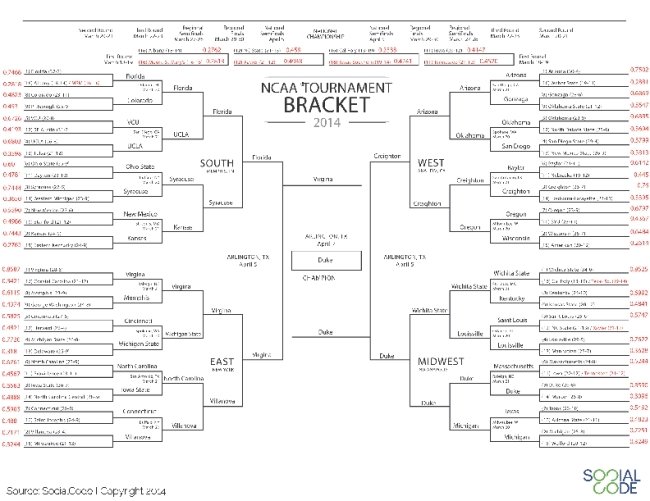 In 2012, SocialCode Labs therefore decided to fill out a bracket in which every victor was chosen according to a “composite score” based on which team in a given matchup had more relative college alumni that, according to Facebook’s ads application-programming interface, were “interested” in college basketball. In 2013, more advanced targeting options from Facebook allowed SocialCode Labs to factor student affinity toward college basketball into the composite score, so it was the sum of three factors: alumni social rank (number of alumni basketball fans/number of alumni) + student social rank (number of student basketball fans/number of students) + seed ranking. While not quite as successful year over year, the composite score still proved accurate through the final eight teams in the tournament in 2013. 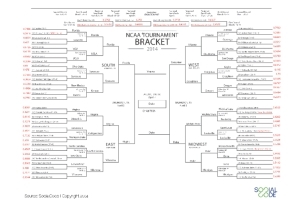 And now that March Madness 2014 is upon us, SocialCode Labs repeated the same formula for the composite score and delivered the following bracket (full-sized version embedded below). We look forward to analyzing the results as the tournament progresses and will report back with an additional analysis once the victor emerges. But for now, anyone looking to create a bracket based on hard science that’s proven effective in past tournaments need look no further. Readers: What do you think of SocialCode’s methodology?